SAN FRANCISCO, October 9, 2018 – Human embryos start as a tiny mass of cells that are all the same. The first step in growing from a homogenous ball of cells into a complex individual with distinct organs and tissues is for the cells to divide into distinct populations. Scientists at the Gladstone Institutes have modeled this first step in human development in a laboratory with the goal of better understanding how organs form. With this knowledge, they hope to create more authentic organoids that can be used for drug testing, disease modeling, and potentially even transplantation. 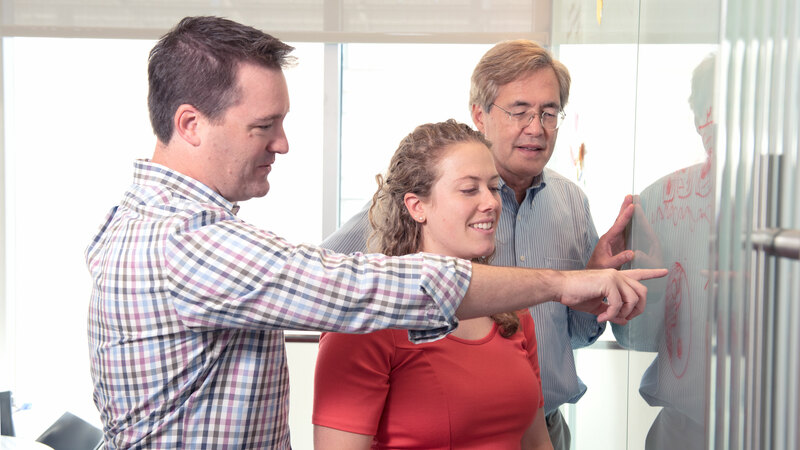 The new study, published in eLife, is the result of a collaboration between Gladstone Senior Investigators Todd McDevitt, Ph.D., and Bruce Conklin, MD. The researchers edited groups of human pluripotent stem cells—which have the ability to change into any cell type in the body—to silence genes important for cellular mechanics. The alterations prompted the cells to move around and self-organize until they were divided into two groups: those that had been manipulated and those that had not. This physical division ultimately influenced what type of cells they would become. The new knowledge about how the physical organization of cells influences their identity provides researchers with a more robust method to create organoids—miniature, simplistic organs that are developed from stem cells. The paper “Spatiotemporal mosaic self-patterning of pluripotent stem cells using CRISPR interference” was published by eLife on Oct. 9, 2018. Other contributors to this study include David A. Joy, Po-Lin So, Mohammad A. Mandegar, and Federico N. Mendoza-Camachofrom Gladstone, as well as Jonathon M. Muncie and Valerie M. Weaver from UCSF. The research was supported by the Gladstone Institutes, the California Institute of Regenerative Medicine, the National Science Foundation, and the National Institutes of Health.